The first issue of the Gazette on May 14, 1846. What of the Vineyard as it lived and breathed had its being on the Gazette’s natal day, one hundred years ago, May 14? No man alive can say with absolute certainty, no library reference room holds the secret, no contemporary historian set the story down for us to read long after. One source and one alone provides a portrait, a little blurred and fore-shortened now in the light of years. The picture hangs in no gallery or home or museum of the treasures of the past, but is spread forever in the pages of the first issue of this newspaper. And although it serves well to portray the past, it is of course that past as seen by those deep, poetic eyes of the founder, Edgar Marchant, whose personality was too emphatic, too vivid, not to have marked it forever. It is fair to assume that Edgartown - for the Old Editor’s loyalty and interests were in his own hometown and not in the Island affairs in general - had its quota of births, deaths, marriages, accidents, political happenings, storms or fair weather goings and comings, in that second week of May, 1846. But in common with the daily and weekly, city and country, press of the day, they found no place on page one, reflecting the proverbial reticence of the English cousins on whose journalistic methods those of the younger country were founded. “Literature” and “Morality” elbowed each other for the first page space. The column which supported the masthead was comfortably filled by two poems, one, My Sister’s Death, by J. Ira Adams, and one, Lines Written in the Country, by “Mahomet,” who quoted Montgomery to this effect before penning his own versus: “In every clime the magnet of the soul, touched by remembrance trembled to this pole.” Both were written especially for the Gazette. Marine Intelligence, in a type which tries the eyes, features arrivals and departures at the ports of Edgartown and Holmes Hole. Reports from the New Bedford oil market were almost as closely read in those times as stock market reports of today and ran as a permanent feature of the Gazette from its first issue until the death of the whaling industry. One searches the advertising pages in vain for the name of a firm which has survived the century. There is a steamboat schedule to be sure, but one of the concerns which was a forerunner of a forerunner of the company which served the Island for so many years. Many of the names of owners are familiar of course. E. G. Pease on Main street was a versatile fellow, advertising “Groceries, Provisions, Ship Chandlery, etc”; James M. Coombs had on hand and was constantly manufacturing Hats and Caps, while Jos. V. Kelley offered Blocks and Pumps; and Marchant and Mayhew advertised as Sailmakers. By far the most colorful of the advertisements were those listing garments and materials for male and female wear. Only a slight fling of the imagination is needed to people the streets of the town with figures clad from top to toe in broadcloth, beaver cloth, pilot cloth, cassimeres and satinets. The gentlemen wore boots and shoes of calfskin or goatskin, and their cravats were of “Italian and imitation black silk.” The ladies were further adorned with silk, light kid or cotton gloves, with shell and horn combs firmly anchoring their tresses, their bonnets be-ribboned, their pocket handkerchiefs of “flag and twilled silk.” Oh, brave, and vanished world of yesterday. 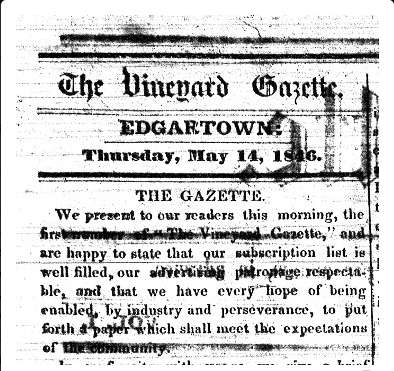 So ends a survey of the first issue of the Vineyard Gazette, one copy of a newspaper which will never be tossed in the wastebasket, but which we hope will survive as long as the Gazette. As you were warned earlier, it gives but an imperfect picture of the Island, and particularly the Edgartown of the day, but it is possible to fill in the gaps in many instances and it is necessary to abide by the record, incomplete as it is, for there is no other extant.